Creative and Focused – Out Of KC! AOART5 is an LLC out of Kansas City. AOART5 pursues masterful artistry and design while taking on fun, challenging and creative projects. AO is a designer and artist who enjoys producing sports art, comic books, graphic art (including web work) and other genres of art. AOART5’s goal is to exceeding the client’s expectation through an exchange of ideas, communication, planning, design and hard work. 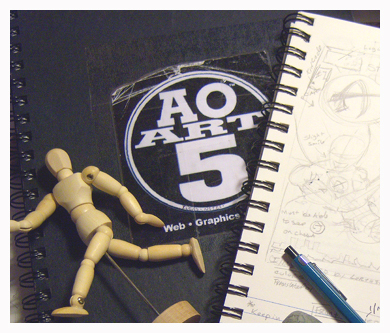 Most of AOART5’s Creatives work full-time jobs and are called upon depending on the project. We work at night and weekends – and are definitely deadline driven. Working nights and weekends is unusual and not easy for most businesses but that is what keeps our prices low. Our small but resourceful team comes with years of experience and is equipped with a large range of talent. We DO NOT Have a Studio Building – But We Are A Studio. No brick and mortar. No warehouse. No gallery. We just utilize a space at the home-studio and various coffee shops across the city. For meeting with clients, we love utilizing a small list of KC coffee shops and eateries, or we can meet at your office. Nights & Weekends – No Normal Business Hours – No Faking! AO (and most of his project Creatives) work nights and weekends. The reason, AO has a steady 9-5’er and enjoys working on other projects in his spare time. With over 20 years of design experience in graphics, web, publishing, storytelling, illustration and painting, AO can deliver a great product for your home, project or campaign. Contact AOART5 – Get a Quote! So if you would a quote or to meet and chat about an awesome project – contact AO via our contact page, social media outlets or call. Let’s meet for lunch or in the evening somewhere to see what we can do to make your idea / project even more awesome-er!